There is something very interesting written in this recipe for Mince Pies from 1740 … when describing making the mince pies Hannah Glasse says, “If you chuse meat in your pies …”, now this sentence is of course very ambiguous, but because Hannah Glasse used the word ‘if’ we can reserve the right not to use meat if we do not wish to … making it a thoroughly modern tasting fruit only mince pie (using suet) from 1740. This statement from Hannah Glasse probably stems from the fact that not everyone could afford to put meat in their pies, but it also strongly suggests the fact that some people chose not to put meat in their mince pies, particularly when she then says … “But you must double the quantity of fruit when you use meat”, which is an extra instruction for when meat is used. Note: the mincemeat is made up without meat, it is then stored and aged; only when making the pies is the meat added in ‘if you chuse’. Note On Making The Mince Pies: I am making two types of mince pie with this recipe, one with and one without meat; Hannah Glasse suggests either neat’s tongue or boiled beef. The mince pie made with meat, as suggested, will be made in a dish, “something bigger than a soup plate”. However, for the mince pies made without meat I am going to use a traditional 12 hole mince pie tin, for as Hannah Glasse says, “If you make them in little [tin] patties …”. 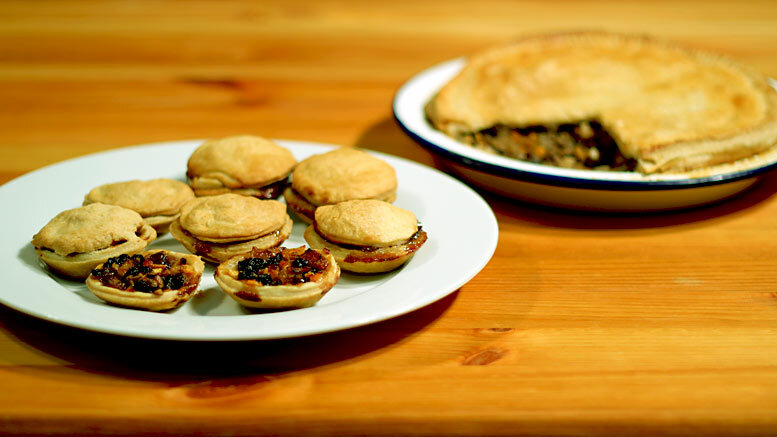 Both types of mince pie will be made with the suggested puff pastry. Make the mincemeat up according to these instructions: 1740 Mincemeat Recipe. I am using a prepared mincemeat (made above) which I have aged for 2 months. For the meat I have boiled the minced beef for 15 minutes then drained it and left it cool. On a lightly floured work surface roll out the puff pastry to about 3mm thick so that you can cut out a large circle of pastry which will fit into the dish and cover the base, and a second, smaller pastry circle, for the pie lid or crust. Spoon over the pastry base a thin layer of the cooled boiled minced beef. Then on to this layer of beef scatter over some very finely peeled citron rind (or lemon rind) chopped small. Spoon over a layer of the prepared mincemeat, then on top of this scatter some finely peeled orange rind which has been chopped small. The final layer is some more boiled minced beef spooned over. Then squeeze some orange juice over the mince pie filling. Use a little milk to moisten the pie crust edge and place the pastry lid on top of the pie. Using your fingers or a fork, crimp the edges of the two pastry circles together so the pie is sealed. When sealed brush the top of the pie pastry with a little milk and bake in an oven at 190C for 25 to 30 minutes until the pie is golden brown. After the mince pie is baked remove from the oven and serve in slices, either warm or cold. On a lightly floured work surface roll out the puff pastry thinly so that you can cut out 12 circles of pastry which will fit in the pie tin bases, and 12 smaller pastry circles for the mince pie lid. In each pastry base scatter over some very finely peeled citron rind (or lemon rind) chopped small. Onto this spoon a layer of the prepared mincemeat, then sprinkle over some finely peeled orange rind which has been chopped small. Finally squeeze some of the orange juice over each mince pie filling. Moisten the pastry edges and seal each pie with one of the pastry lids. Using your fingers, or a fork, crimp the edges of the two pastry circles together so the pie is sealed. When the pie is sealed brush each pastry lid with a little milk and bake in an oven at 190C for 20 to 25 minutes until the pies are golden brown. After the mince pies are baked remove from the oven and serve either warm or cold. Tasting Notes: Because the chopped orange peel and juice goes in fresh to the pies orange is the dominant taste, in both types of mince pie. The pie which includes the boiled beef tastes very much like a mince beef pie, flavoured with orange and citron … perhaps not to everyone’s taste … but the small mince pies, made without the meat, are very good, and the apple stays remarkably crisp from the matured mincemeat, with a nice, subtle taste of Brandy. Take three pounds of suet shred very fine, and chopped as small as possible; two pounds of raisins stoned, and chopped as fine as possible; two pounds of currants nicely picked, washed, rubbed, and dried at the fire; half a hundred of fine pipins, pared, cored and chopped small; half a pound of sugar pounded fine; a quarter an ounce, of mace, a quarter of an ounce of cloves, two large nutmegs, all beat fine; put all together into a great pan, and mix it well together with half a pint of brandy, and half a pint of sack [wine]; put it down close in a stone pot, and it will keep good for four months. These pies eat finely cold. If you make them in little patties, mix your meat and sweetmeats accordingly. If you chuse meat in your pies, parboil a neat’s tongue, peel it, and chop the meat as fine as possible, and mix with the rest; or two pounds of the inside of a sirloin of beef boiled. But you must double the quantity of fruit when you use meat. *Mince-pies must be baked in tin patties, because taking them out, and puff-paste is best for them.